This autumn fall came early to our neighborhood. What I mean by that is Labor Day weekend it may still have been eighty degrees in our neighborhood but we lost a quarter of our apple tree in one snap and we had a plethora of apples on our hands. Oh, poop. “Who wants to take some apples home?” I asked nearly every person leaving our Labor Day party. 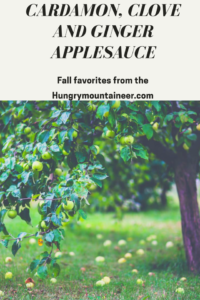 It wasn’t technically even fall yet, I was still wearing summertime rompers and was nowhere near ready to break out the Ugg’s but we had a ton of apples on our hands and on the grounds of our garden. It was time to juice some apples. And learn to make applesauce. Luckily for us, our cupboards are full of authentic Indian spices that go just amazing with Granny Smith Apples to make the most delicious applesauce to ever baste a bacon wrapped pork chop. Because, lets face it, can you ever have enough bacon? In a saucepan, boil the apples for twenty minutes. Add the cinnamon stick, dates, cardamom, and ginger. Let boil another twenty minutes. You can add double the dates if you like it sweeter. Put in a blender and blend until smooth. I store mine in mason jars until its pork chop time. This week, I’m linking up once again with the following blog hops.